We were so looking forward to the doggy Good Friday buffet lunch organized by Zeus Communications. Vincent can indulge in his favourite all-you-can-eat way of eating while contributing to the upkeep of the dogs at Zeus' shelter. 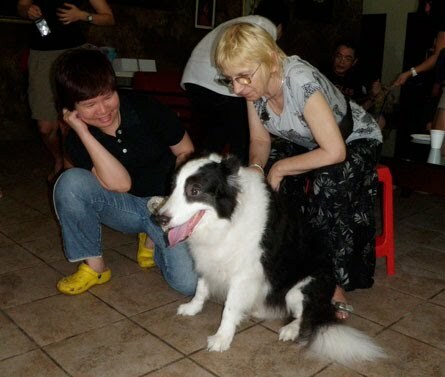 Lynda, the founder of Zeus Communications, was the nice lady who facilitated the adoption of Cookie few years ago when she was volunteering with Noah's Ark. Good Friday came and greeted us with cats and dogs. The downpour, that is. We arrived wet and hungry in the pouring rain. Then, a loud thunder struck. This was the first time we saw Cookie being scared by thunder. She became very jumpy. Wet floor, wet paws and white blouse were not a good combination. A mud painting was instantly created on the canvas of my white blouse. "She's scared, she needs a hug," Lynda said. So we try to hug a jumpy Cookie. Thank goodness she did calm down slightly. 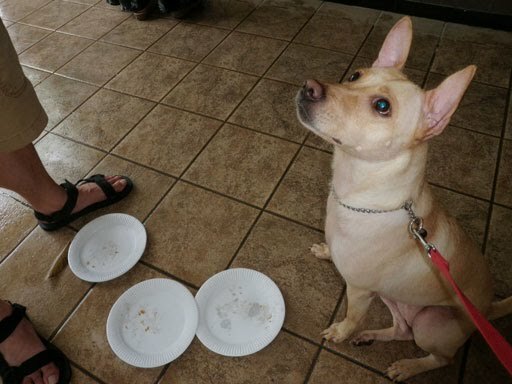 Other dogs and owners seemed normal and calm, although they were also in attendance to meet and consult Rosina, the animal communicator. 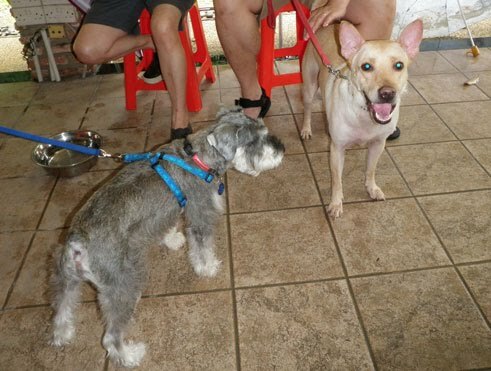 Cookie's eyes were fixated at the buffet line (below pic, buffet line was beside the camera) that she was totally oblivious to the friendly schnauzer who tried so hard to be her friend. 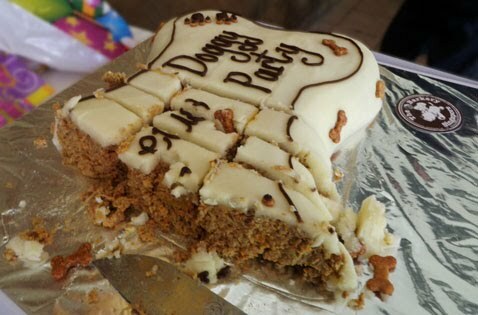 Whilst the humans enjoyed their food from the human buffet line, the doggies were in for a savoury cake treat from The Barkery Singapore. Cookie's hungry poor-thing look earned her three pieces of the cake! Rosina came by each owner to answer our questions about our pet. I didn't have to ask any question, the mud painting on my blouse said it all. After looking at Cookie and 'feeling' her energy, Rosina told us that Cookie doesn't know how to behave in public, she hasn't been taught how to do so, and that my aura as her pack leader is weak, I am not in control. Sounds familiar? 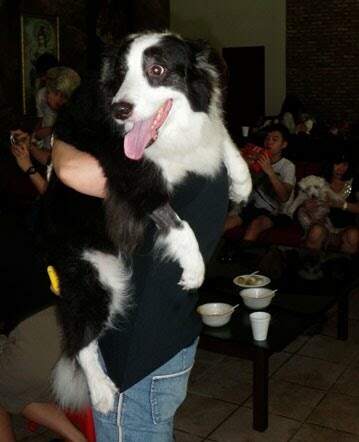 We then saw this super timid border collie 'Blackie' who needed to be carried around. He's big in size but tiny in courage. He reminds me of the Lion in Wizard of Oz. Here's Rosina observing Blackie and advising his owner. So my homework is to practice and generate a pack leader aura. How to practice? I read about Cesar Milan's rule of "exercise, discipline, and then affection". I have been doing it the other way round!